Why does the music business target only teenagers and twenty-somethings? As a middle-aged female, I’m a member of what seems to be the “despised demographic”—the one nobody cares about. Although youth and beauty are lovely qualities, they don’t hold a candle to the ones developed later in life: self-esteem, wisdom, success, depth, and happiness. We still have passion and excitement, and money, too! The Screen Actors Guild reported that Americans over the age of fifty own 77 percent of all financial assets, account for 40 percent of total consumer demand, and control a net worth of nearly $7 trillion. Don’t you think someone in the music business ought to sit up and take notice of that? Because I became a Bon Jovi fan at age fifty-two. It took me by surprise. I happened across them on a segment of Behind the Music on VH1 and was struck by the band’s passion and charisma. Joy of life and living throbbed through their music. I watched the entire show, and before long, I was hooked. The next day, I bought their greatest hits album and sang along with it for the rest of the week. Then I bought all their other albums and a video and signed up for their fan club. I admit I struggled with myself at first. We don’t break out of boxes without interior battles. I’m a grown woman; I own my own business. I’m not a young chicky to be seduced by a heavy metal band. I didn’t think I fit the hard-rock profile at all. I loved Country, Bach, Broadway, and the Beatles. But I broke out of my music box and found a passion for a hard rock band. Am I having a mid-life crisis? Have I lost some part of my sanity? Well, maybe I have. But if so, then I recommend it. Lose your sanity; your self-descriptions that keep you locked in your current self, making each day a replay of the last. Life is a banquet; it’s rich spread lies before you in glorious diversity. You may like fried chicken, but if you don’t keep exploring, you may never discover the chicken curry, chicken cacciatore, or Chicken Kiev. White rice is wonderful, but if you stop there, you miss the shrimp fried rice, the rice pilaf, the curried rice, the basmati rice. There’s a world of delightful tastes beyond what you know. Don’t let anyone tell you you’re too old to enjoy it. Break out of your music box today. Join another party; feast at another banquet. Eat up life. Who cares if it’s young, or new, or “just not you”? Your capacity for joyful experience is immense, but you have to take it out of the box and use it. 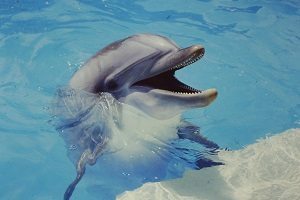 Swim with dolphins and enjoy a happy life! Beyond the music, as I have followed Bon Jovi, I have been most impressed by Jon Bon Jovi’s business acumen. When I watched a documentary about a recent tour, Jon was on the phone talking to some high level investors about purchasing a football team. Brushing aside his star status as a rock star, he said, “I’m the CEO of a multi-million dollar corporation that’s been running a brand for 25 years.” Whoa. I hadn’t quite looked at him that way before. Let that be a lesson to all artists who want to succeed in the entertainment business. Back in my acting days, that lesson was impressed upon me by an old character actor who was on a Screen Actors Guild committee with me. He told me quite succinctly that “show” is an adjective modifying the noun “business”. Never forgot that! I saw a video recently of some 8 or 9-year-old boy who, when asked who his favorite band was, enthusiastically replied, “Bon Jovi!” The brand of the band is working strong, attracting new customers in new demographics! Gotta love it. What do you enjoy that’s a little outside your box?